A new infographic issued by the National Shooting Sports Foundation tells the story, at a glance, of the growing number of new target shooting enthusiasts and how they’re surprisingly different from established shooters. Newcomers—defined as those who have taken up target shooting in the last five years—are trending younger and female; also, they are city and suburban dwellers. In these ways, they are quite different from established participants and, as a result, are changing the face of target shooters in America. This influx of newcomers also underscores that the traditional pastimes of handgun, rifle and shotgun target shooting continue to have a broad appeal to new generations of Americans. Driven by newbies, target shooting participation has leaped by 19 percent, from 34.4 million in 2009 to 40.8 million in 2012. That’s a 6.4 million increase; for comparison, golf and some other traditional activities have seen their participant base decline by millions. Although they may be different in age and gender, newcomers share one important thing with established participants—their passion for firearms ownership and the shooting sports. 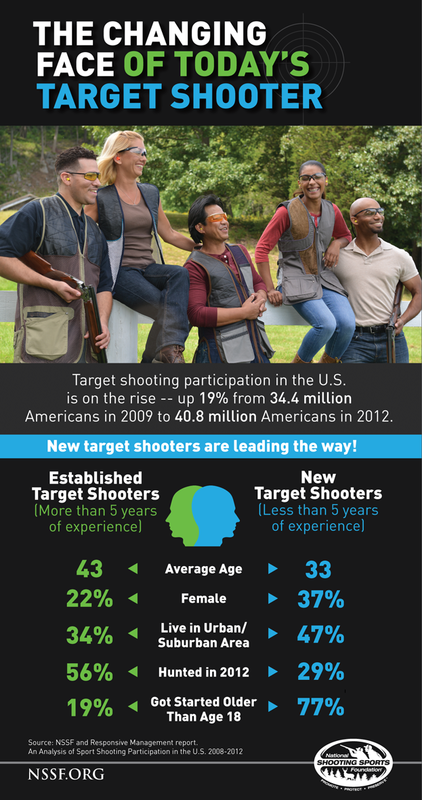 NSSF invites you to use and share “The Changing Face of Today’s Target Shooter” infographic to educate the public on this exciting and positive trend in the shooting sports and in our industry. Click the infographic to download, and you can find other informative NSSF infographics at http://nssf.org/infographics.